In 1979, Floyd Cannon started Cannon Pianos as a way to provide the passionate musicians and music teachers of California with high quality piano tuning and repair services. By 1980, the business had expanded to include piano rentals. Seeing more opportunity for growth in the area, we opened up our full service piano store, complete with a retail, rental and teaching space in 1982. 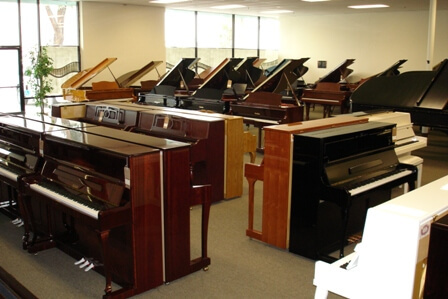 With a heavy focus on quality products and friendly and professional service, we’ve been proud to be Inland Empire’s most experienced and comprehensive piano store ever since. Our staff includes a concert piano tuner as well as several other technicians, so whether you’re tuning, repairing or restoring, our team has the necessary expertise to treat your piano with the care and professional service it deserves. We’re passionate about piano education too! We love working with music teachers to provide the best quality equipment and services for their piano students. In addition to our piano repair, tuning and restoration services we also offer piano rental, piano lessons and a teaching studio. We understand how deeply personal our customer’s connection to their instrument is, so Cannon Pianos places an emphasis on building one on one relationships with our clients. We’re probably one of the only piano stores in Inland Empire that still has personal contact with every single one of our customers and we wouldn’t have it any other way. If you’re looking for unmatched professional piano expertise in San Bernardino or the surrounding areas, look no further than Cannon Pianos. Rent a Used Piano for as little as $25.00 a month! New Piano Rentals Starting at only $50.00 a month! Rentals are month-to-month, with no contracts! You can apply 12 months of rental fees toward your purchase! We also do overnight rentals for parties and weddings!